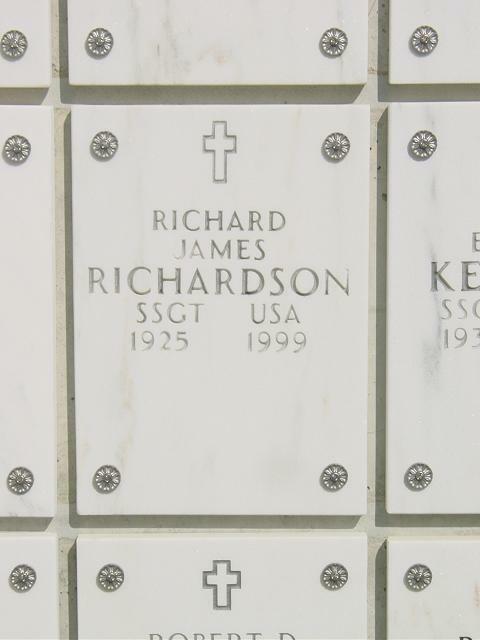 Richard James Richardson, age 73, died July 14, 1999 of pneumonia at Memorial Hospital in York, Pennsylvania. He retired from the Central Intelligence Agency in 1979 after 30 years of service. Mr. Richardson was born October 20, 1925 in Accomac County on Virginia's Eastern Shore. He was raised in Makemie Park and later attended Atlantic High School in Oak Hall. During WWII, he was posted to the Pacific as a B-29 tail gunner assigned to the 9th Bomb Group, 99th Bomb Squadron. He flew 36 missions against the Japanese home islands and received three Bronze Stars, the Air Medal (four bronze clusters) and the Distinguished Flying Cross. In 1950, he went to work for the CIA. There he met and later married the former Mary Patricia Monaghan of Washington, DC. They raised six children during various assignments to Japan, Thailand and South Vietnam. In 1963, the family moved to Sterling, VA. It was here that Mr. Richardson helped establish the first little league baseball league in eastern Loudoun County. In 1983, after 30 years of marriage, the couple divorced and Mr. Richardson moved to York, PA where he lived until his death. While in York, he was an active member of the Victory Athletic Association where he enjoyed the company of many friends and neighbors. Mr. Richardson was predeceased by his eldest son, Richard James Richardson, Jr. He is survived by his former wife, Patricia Richardson of Ashburn, VA; five children, John Edward of St. Petersburg Beach, FL, Craig Patrick of Ashburn, VA, Michael Brian of Sterling, VA, Patrick Fisher of the District of Columbia and Elizabeth Tracy Wolter of Belvidere, IL; three grandchildren, Shawn, Christine and Carolyn and his brother Donald Lee Richardson of Hampton, VA.
Inurnment will take place at Arlington National Cemetery on Friday, September 24, at 2 p.m. Those wishing to attend should meet at the Administration building at 1:30 p.m. There will be an informal reception following the service at the Key Bridge Marriott in the View Ballroom between 3 and 5 p.m. In lieu of flowers, the family requests donations be made to the WWII Memorial Foundation by calling (800) 639-4992, or via the web site: www.wwiimemorial.com.